Use Internet Explorer 9? It may be sending your entire browsing history to Microsoft. Or, it may be automatically blocking tracking websites. It’s all in how you tweak Internet Explorer’s privacy settings. Internet Explorer’s tracking protection is a standout feature, but suggested sites, the SmartScreen filter and search suggestions can leak your private information. Tracking protection isn’t enabled by default, so you’ll have to enable it for maximum privacy protection. 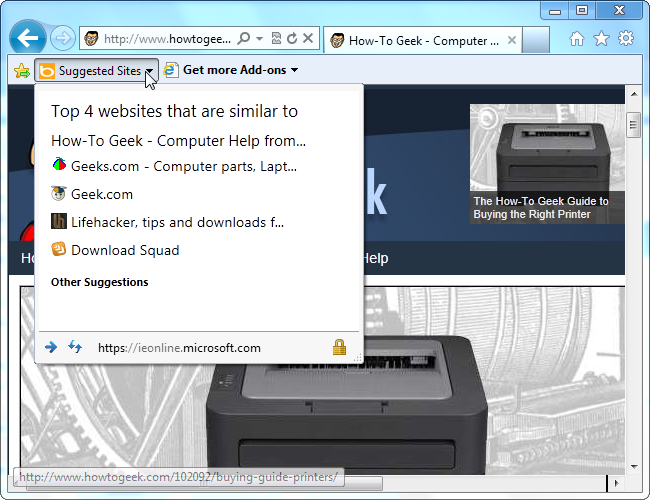 Internet Explorer 9 automatically sends your entire browsing history to Microsoft is suggested sites is enabled. Microsoft saves your browsing history and compares it against against other similar sites. Internet Explorer displays these similar sites as suggestions when you open the Suggested Sites folder on your favorites bar. Don’t want Internet Explorer 9 sending every website you visit to Microsoft? Just click the gear-shaped Tools menu icon and select Internet Options. From there, click over to the Advanced tab, locate the Browsing section in the list and uncheck the Enable Suggested Sites check box. 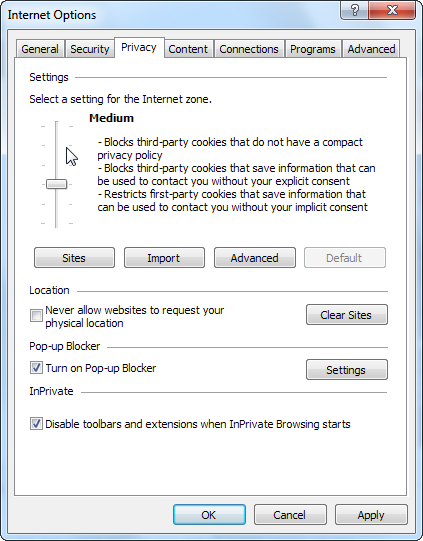 Click OK and Internet Explorer will keep your browsing history private. Internet Explorer 9 allows you to install custom tracking protection lists, which contain a list of scripts and other files that track you. Internet Explorer won’t load these files if you visit a page that uses them, preventing everything on the list from tracking you. 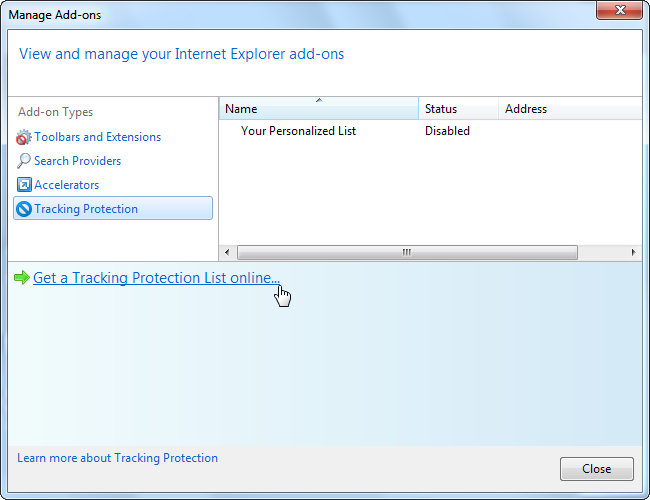 Internet Explorer 9 also sends a “do not track” request when you have a tracking protection list enabled. At the moment, most websites will ignore the do not track request. Internet Explorer 9 doesn’t have any tracking protection lists installed by default, so you won’t get any protection until you install one. Just click the Tools menu, point to Safety and select Tracking Protection to see the tracking protection lists you have installed. Click the “Get a Tracking Protection List Online” link to see a gallery of available lists on Microsoft’s website. 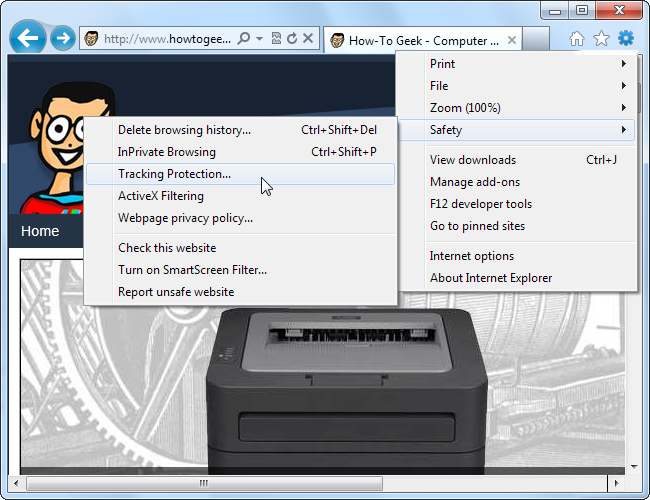 Install a tracking protection list by clicking its Add button. Here we’re installing the EasyPrivacy tracking protection list. It’s maintained by the same people that work on the EasyList ad-blocking subscription for Adblock Plus. Internet Explorer 9 will download an updated version of your tracking protection list once a week. 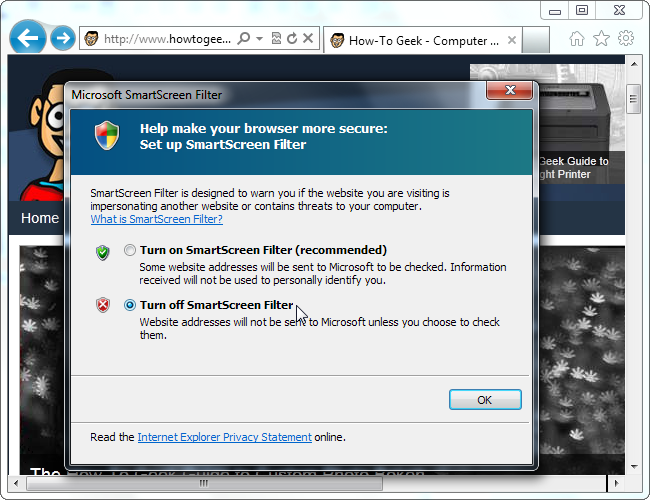 Internet Explorer 9’s SmartScreen filter helps keep you safe online by detecting known unsafe websites, but it does this by sending website addresses you visit to Microsoft. When you visit a website, Internet Explorer 9 checks a downloaded list of popular, safe websites. If the website you’re visiting doesn’t appear on the list, IE sends it to Microsoft, where it’s checked against a list of unsafe websites. Select the Turn Off option in the window that appears and click OK. You can still manually check a website by clicking the “Check this website” option in the Safety menu. 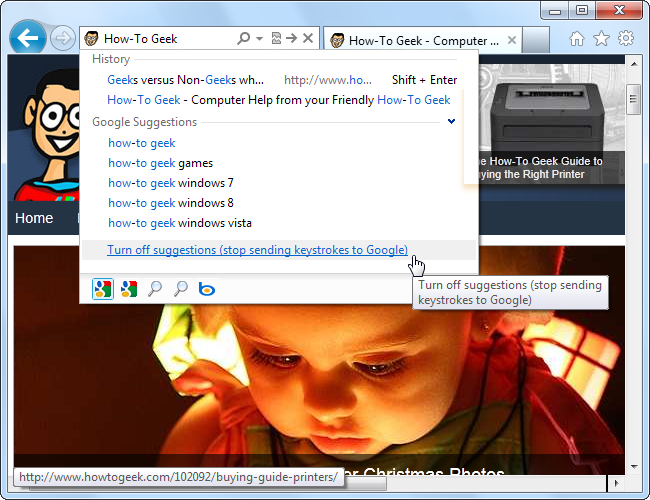 Internet Explorer’s search suggestions feature sends everything you type into your address bar to your default search engine. 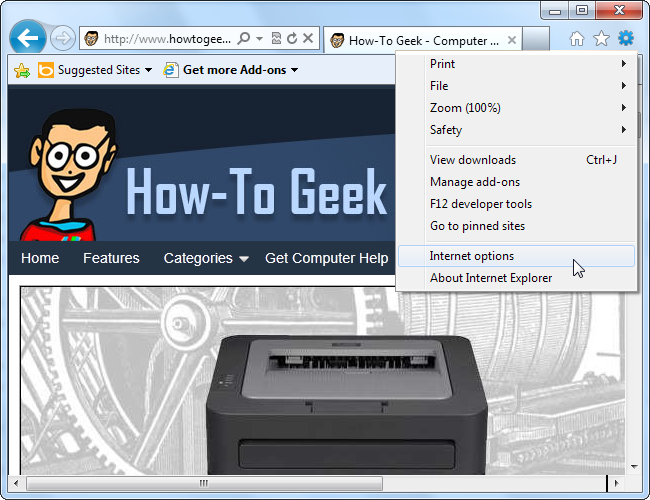 The search engine sends back related searches, which IE displays in a drop-down box. Internet Explorer 9 uses a combined address bar and search box, so your default search engine will see website addresses you type if you have suggestions enabled. Disabling search suggestions is as easy as typing something into your address bar and clicking the Turn Off Suggestions link. Drag the bar higher to block other types of cookies. At the top-most position, websites won’t be able to save cookies at all, which will prevent you from logging into websites. Other settings may also cause problems with some websites; lower the slider if you encounter problems. At this point, you should have IE9 locked down tight! 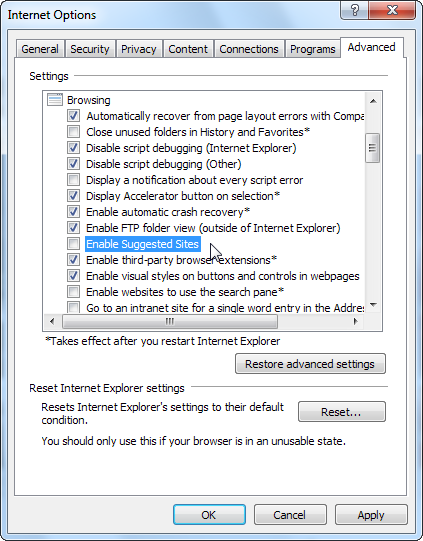 Internet Explorer 9 can be one of the least private or most private browsers, depending on how you configure it.